First of all, we looked at it and wanted to make sure if this was authentic. Is this video coming from a true [Department of Defense] platform? Then what we do is apply some analytics that allow us to look at range, altitude, what was the aircraft doing that we were flying, who's flying it, under what conditions, sea states. So there's a lot of things at play into what we're looking at. And then at that point, we try to look at what we're seeing at the video and cross-reference it to anything that we may know that is currently in our inventory — so whether they be drones, commercial aircraft, military aircraft, missiles — whatever they may be. There is a great deal of effort by the department to make sure that we always can identify what is flying — whether it is in our airspace or any other airspace. There's a lot of rigor and diligence that's placed in looking at these, and there is some real talent in the department and in other agencies within the U.S. government that have just an incredible battery of tools to apply toward these things to make sure we know what we're looking at...."
I was told by an anonymous email that two people "scored the info, circumstances et al, around the "Gimbal" footage mystery". I contacted one of them and they said "What I suggest you do is write to TTSA or maybe George Knapp or someone and ask." George Knapp is the Las Vegas TV journalist and Coast-to-Coast host who has been granted access to TTSA. It seems to me like the situation is simply being played for publicity. Yes frustrating indeed. 15 mins fielding questions on metabunk would be immensely valuable. Not only that, but he proposed to have a call or a face to face meeting with one of the members there and seems like that (phone call probably) actually happened. So if someone like Mick would contact him, he might very well be willing to answer some questions. You can send a Freedom of Information request. For the Nimitz case, this would be easy as you would request any and all documentation and media relating to a specific time frame or relating to a specific pilot etc. The Gimbal case would cost you a fortune and a half as no details have been released. If you send a FOIA request for exceptionally large files (ie everything the program collected) they often make you pay per page after a certain amount. You would have to look up the FOIA statutes relating to the Federal government. So reportedly in this case, the material has been released because of an internal memo made by Elizondo, and TTSA has probably received it through some direct connections and not by FOIA? And then TTSA has given (parts of) that to select media and now they seem to be promoting themselves by giving limited access to information that in principle is already officially public? Do we even rightfully know that the target is a flying object? What evidence do we have that it's not, as Mick's analysis above suggests it could be, stationary but also on land or sea? Note that the FLIR is pointed -2˚ below. So could it be aimed at distant land we can't otherwise make out? In other words, could this be a rerun of the Mexican Air Force FLIR misidentification? I don't think so, as movement of the clouds works best if they are behind and below the object. 2° down gives a relative altitude from distance of 184 feet per mile away, so 1800 feet at 10 miles, and 18,000 feet at 100 miles. if it's unclassified you can get it through FOIA. If it's classified Elizondo is in serious trouble for releasing it.. which I have to think he would know. This is probably a clue to the rotation-causing mechanism in the FLIR system. Notice in the military-action FLIR footage, we see a rapid 180˚ flare rotation and when it comes to a dead stop (suggesting a mechanical limit is hit) it almost seems to 'slam' to the stop and then the entire scene pivots in the direction of the rotation. It's as if the rapid 180˚ motion was caused by a component that exerted force on another component that defines the scene's orientation (the camera?). My gut sense is the scene pivot reflects the camera's position and so whatever rotated is directly attached to the camera. Notice too that the ELV data seems to change from 183F to 122F (reading that data is not easy). But I have trouble believing the jet is only 183 feet away or that, across the length of the whole clip, it's elevation would be so erratic. So I don't know what to make of the ELV data. Video says it's "2° below aircraft axis". Does that mean the primary axis as if the wings were level (or like measured as if it was looking straight ahead from the nose, as in "forward-looking")? So in this case that would be equal to level ground, as the altitude is more or less constant. It can't be relative to a plane that is in 20° angle turn as the value stays the same even as the plane banks and camera rotates. As for the Mexico UFO, they only had flir without radar returns, if I remember it right, whereas in this case they seem to have both (assuming they saw the same thing). If they had this/that fleet on the radar, wouldn't that show their distance and speed as well? They state in the video that "They're all going against the wind. The wind's 120 knots out of the west". 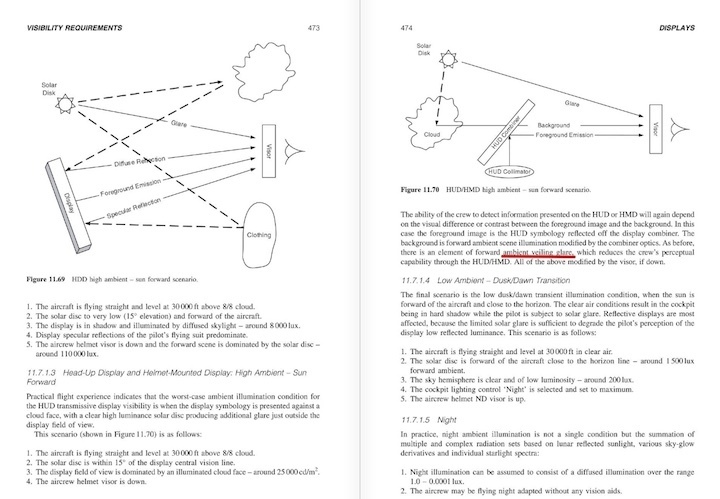 If they were actually looking at some plane on the flir that was unconnected to whatever else they saw on the radar, as was also suggested here, wouldn't that have a definite target on the radar and one that would probably stick out as having somewhat different trajectory and speed than the other targets? Also would they see transponder data as well if it had one on (if it was an airliner for example)? I saw the same post of his which led me to think he might come here at some point maybe when the hubbub has died down a bit. Video says it's "2° below aircraft axis". Does that mean the primary axis as if the wings were level (or like measured as if it was looking straight ahead from the nose, as in "forward-looking")? If post #75 is correct, then I take it to be relative to the gimbal forward axis. In that case the rotation of the window could be calculated, and matched to the image 'blur' rotation. Given the camera is @ 25,010 ft, the distance to the earth's horizon is 194 miles. If I understand your numbers, I think that means its 2˚ down LoS could intersect with the earth. No? Other factors you note favoring a flying object aside, it might help define the universe of possible locations. And yes, that's a hell of a distance to imagine an IR source could produce such a large screen signal, but expectations don't always pan out. Perhaps a large forest fire could produce a signal like that over 100 miles away. It is well-understood that (i) the shape of an out-of-focus blur spot or of a lens flare produced by an imaging system is substantially the same as the shape of the imaging system's aperture stop; (ii) the size of the blur spot or lens flare is proportional to the size of the imaging system's aperture stop; and (iii) the orientation of the blur spot or lens flare relative to the detector plane is substantially the same as the orientation of the imaging system's aperture stop relative to the detector plane. Perhaps iii is a clue about a cause of rotation depending on what 'orientation' means. Based on searchable preview clues the book, Military Avionics Systems, may have a study of veiling glare. and searching thereafter in other highly relevant places. 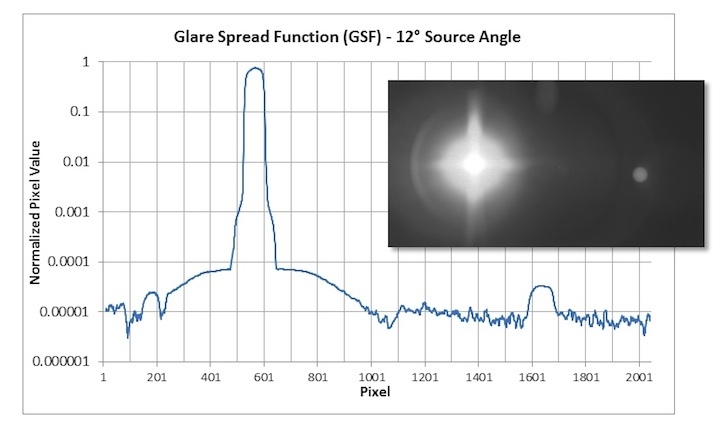 Here's something call the glare-spread function. "I am told the full provenance of that video will be made public soon. It was shown to the NY Times." Persons familiar with the five year study told the I-Team the effort resulted in three dozen thick reports, some of them several hundred pages in length, as well as another three dozen or so technical reports which projected how this kind of exotic technology might usher in a new era of aviation, and what that might mean." "Reid says he is proud to have had a hand in kickstarting the Pentagon study, and contrary to some media reports, the information collected was impressive." "At its peak, the study had 46 scientists working at the Nevada facility, writing reports and analyzing data that came in from the military. Rapid response teams were dispatched to the scene of UFO events. Over five years, the project cost a total of 22 million. it wasn't a money maker for Bigelow." It also says more specifics will be made public "including specifics on what was learned during the study, and which UFO incidents were the most unusual." which I can't seem to find, possibly it is being delayed to be released with the full 5 minute footage of the Nimitz event in a new Times article? Seem like that's more about glare on a HUD (Head Up Display) not on a camera image. One stationary camera records a second camera rotating while facing an LED flashlight. If I posted a video of only footage from the rotating camera, the flare would remain static in the video frame while the scene rotated. But viewing the rotating camera produces a result that's essentially what we see in the footage below, wherein the flare rotates relative to both viewing frame and scene, except the screen data here are locked to the output frame. Yesterday I read but can't at the moment locate a description of tracking pods on jets that said what the camera actually sees is processed to make sense to the pilot, to correspond to her orientation. So there's complex re-framing that takes place from the raw camera output to the final pilot-screen output. It could be that the two-camera demo above roughly models that and the Gimbal rotation is actually the rotation of the gimbal camera. That has to make you wonder if the filename for the footage was 'Gimbal' because that was already figured out. Yesterday I read but can't at the moment locate a description of tracking pods on jets that said what the camera actually sees is processed to make sense to the pilot, to correspond to her orientation. So there's complex re-framing that takes place from the raw camera output to the final pilot-screen output. I suspect that what we see on the screen has an additional level of post-processing rotation to present to the pilot a view that makes sense, but does not reflect the actual position of the optics. This suggests the optical system could make moves that are not seen so much as movements, but change the angle of the camera, and hence change the orientation of the flare.